The geothermal areas of Yellowstone include several geyser basins in Yellowstone National Park as well as other geothermal features such as hot springs, mud pots, and fumaroles. The number of thermal features in Yellowstone is estimated at 10,000 and 200 to 250 geysers erupt in Yellowstone each year, making it the place with the highest concentration of active geysers in the world, thanks to its location in an ancient active caldera. Many of these features build up sinter, geyserite, or travertine deposits around and within them. 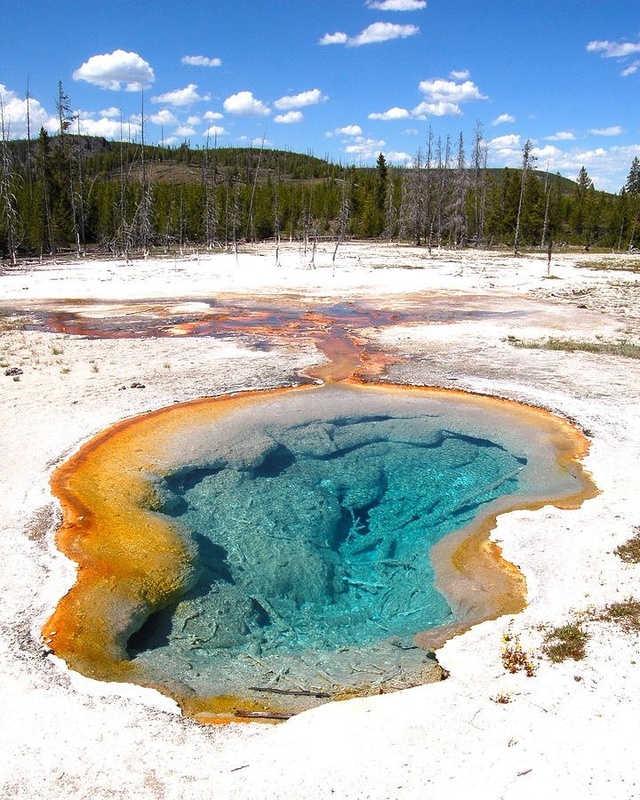 The various geyser basins are located where rainwater and snowmelt can percolate into the ground, get indirectly superheated by the underlying Yellowstone hotspot, and then erupt at the surface as geysers, hot springs, and fumaroles. Thus flat-bottomed valleys between ancient lava flows and glacial moraines are where most of the large geothermal areas are located. Smaller geothermal areas can be found where fault lines reach the surface, in places along the circular fracture zone around the caldera, and at the base of slopes that collect excess groundwater. Due to the Yellowstone Plateau's high elevation the average boiling temperature at Yellowstone's geyser basins is 199 °F (93 °C). When properly confined and close to the surface it can periodically release some of the built-up pressure in eruptions of hot water and steam that can reach up to 390 feet (120 m) into the air (see Steamboat Geyser, the world’s tallest geyser). Water erupting from Yellowstone's geysers is superheated above that boiling point to an average of 204 °F (95.5 °C) as it leaves the vent. The water cools significantly while airborne and is no longer scalding hot by the time it strikes the ground, nearby boardwalks, or even spectators. Because of the high temperatures of the water in the features it is important that spectators remain on the boardwalks and designated trails. Several deaths have occurred in the park as a result of falls into hot springs.